Book recommendation: “Deceived on Purpose” by Warren Smith. I recently finished the book Deceived on Purpose by Warren Smith. Smith, a former New Ager turned Christian, wrote this heavily footnoted book after reading Rick Warren’s Purpose Driven Life and seeing the many New Age parallels throughout Rick Warren’s bestseller. Warren Smith chronicles these familiar New Age teachings found in The Purpose Driven Life in his book Deceived on Purpose. 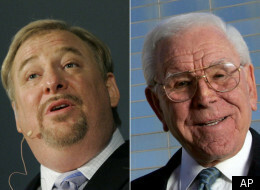 Warren Smith also goes into detail about Rick Warren’s ties to Robert Schuller. And once Warren Smith begins connecting the dots between Rick Warren, Robert Schuller, Bruce Wilkinson, Eugene Peterson and many well known New Agers like Neale Donald Walsch, Bernie Siegel, Benjamin Creme, and others, you will never look at Rick Warren the same way again and you will be even more disturbed as to why John Piper is willing to link arms with Rick Warren. You can purchase the paperback version of the book here, or the e-book version here. This entry was posted in Purpose Driven Lie, Recommended Books and tagged Blogging, Book, Book Recommendation, Book Recommendations, Book Review, Books, Christian Literature, Deceived on Purpose, John Piper, New Age, Rick Warren, Robert Schuller, Warren Smith. Bookmark the permalink. ← Forsake everything and preach Christ to the Arabic world. This book: http://www.amazon.com/Light-That-Was-Dark-Amazing/dp/0976349213 and the one you mentioned are most excellent! I’ve given a couple copies of Deceived on Purpose to pastor friends who were aligned with Rick Warren and one was SHOCKED that such a book existed. New Age none sense is a common element with so many seeker sensitive and emergent folk. “Faith Undone” by Roger Oakland, which also chronicles the current Apostasy, including Warren’s connection to a veritable who’s who of apostates, heretics and occultists. “The Emergent Church, Undefining Christianity” by Bob DeWaay, details just why it is so important for these apostates and heretics to deconstruct and redefine all major areas of Christian thinking (which is being done today by the likes of Warren, Driscoll, McLaren, Pagitt, and others), what their mindset is, where it came from, and how Scripture is in direct conflict with their mindset. Definitely sounds like one I will have to add to my growing list of books I want to read. Thanks for the recommendation Pilgrim.